Popcorn. Sweet or savory. I'm obsessed. The king of snacks. I adore freezing popcorn to make it crunchier. Particularly for sweet coated popcorns. My freezer is always full. I'm always trying new brands. Which lead me to Popcornopolis, a huge popcorn distributor, sold basically ... everywhere. Major grocery stores, Costco, Amazon, even movie theaters and gift baskets galore. Certainly not a artisan small production fancy popcorn. But, it is all non-GMO, 0 trans fat, no high fructose corn syrup, gluten-free, etc. And available in ... all the flavors. Many quite decadent (seriously, Red Velvet, Peanut Butter Cup ... oh my!). All flavors have one key characteristic: the kernels are really well coated! I finally bought Popcornopolis when I was visiting my family in New Hampshire, and wound up in BJ's Wholesale Club with my mom. The place was a wonderland to me, and, somehow, a little 4-pack of cones wound up in our cart. "It’s party time! Here’s the flavor to kick things off. You’ll be amazed how we’ve captured the experience of enjoying a vanilla cupcake —complete with luxurious white frosting and festive colored sprinkles!" The first flavor I tried was also the most decadent: cupcake! 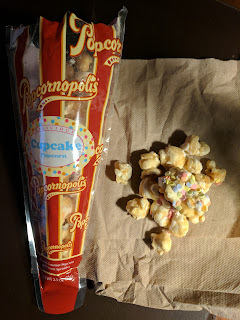 I was in the mode for something sweet, and when given the choice of already sweet caramel corn, or caramel corn drizzled with chocolate, or caramel corn drizzled with frosting and sprinkles ... well, that decision was easy. Go big or go home. It was good popcorn, but yes, very sweet. The kernels were all well coated in sweet, buttery caramel. 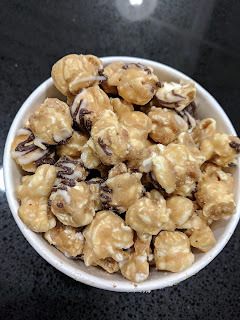 They were a bit softer than I like, but then again, I like to put my caramel corn in a freezer to make it even crispier, so, I might be a bit odd in this respect. The "white frosting" was kinda just more sweet drizzled on top of some pieces, and it caused some pieces to stick together a form clumps, kinda like granola. 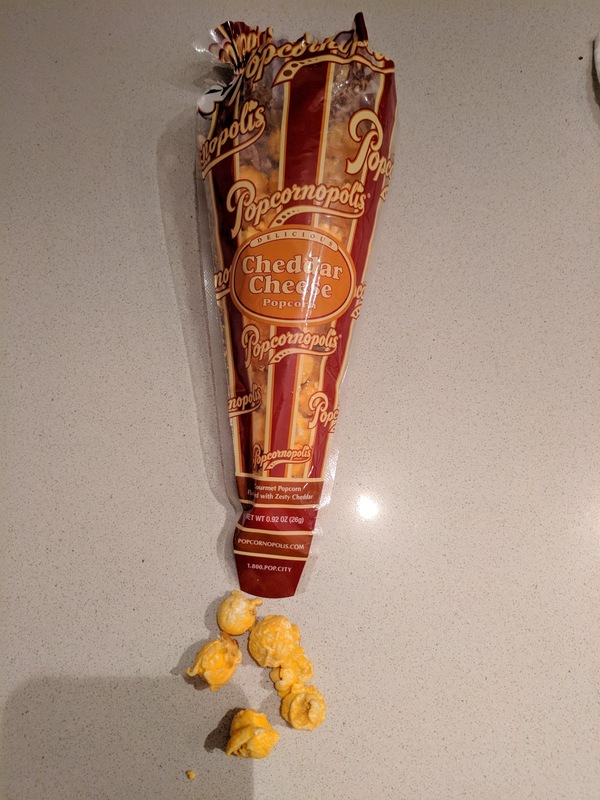 This was the perfect enabler for my "ooh, I'll have just one more piece" mentality, when "one more piece" might be a giant clump rather than a kernel. I liked the clumps, not something normally found in popcorn. The white frosting didn't really taste like frosting, nor like vanilla though, just, like sweet. The sprinkles were round sugar disks, not classic rainbow sprinkles like you have with ice cream. Overall, I enjoyed this. It was sweet, it was popcorn, and, well, those are things I like. Did it taste like a cupcake? Not at all. But, I didn't need it to. I also froze some, to fix the softness problem. It worked great. I liked it even more when frozen, although the sweetness seemed even more pronounced, if that is possible. It was hard to get through more than a few pieces at a time, which, I think is a good thing. "Rich, farm-fresh cheddar covers our World’s Best Gourmet Popcorn™ like a golden blanket of deliciousness. 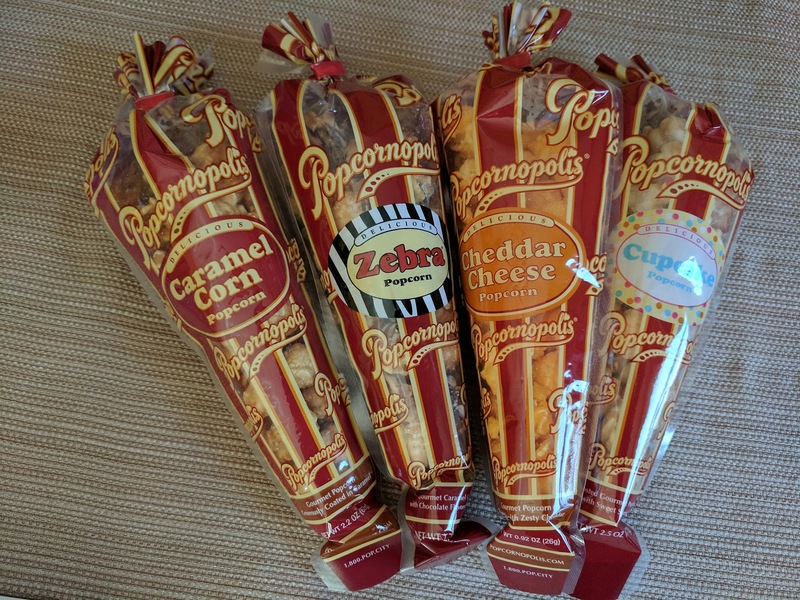 Popcornopolis Cheddar Cheese Popcorn is intense, authentic, and habit-forming." Next, I went savory, for the cheddar cheese. This was good. In a gross way. The popcorn was absolutely coated in very fake cheddar cheese powder. So fake. But yet so tasty. 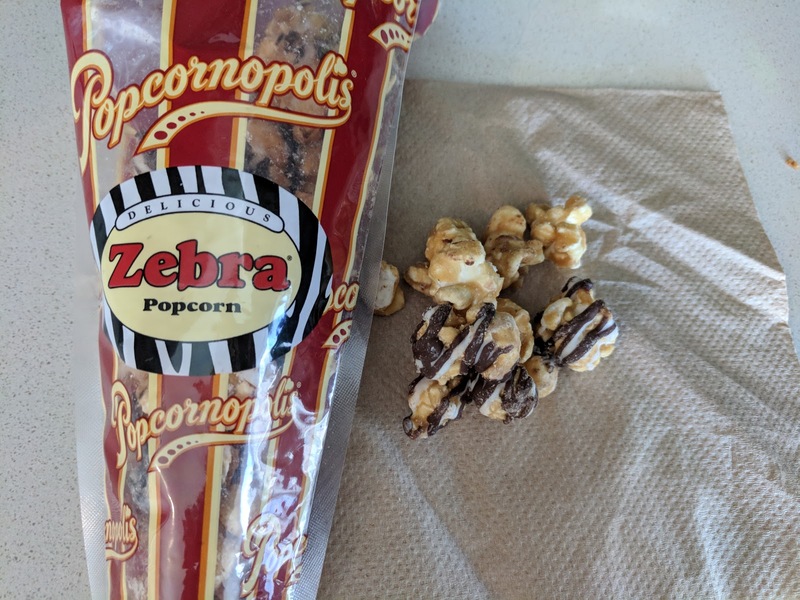 "Zebra® PopcornStill our reigning champion, Zebra is love at first bite! A sensuous and divinely compelling experience, with a taste that you'll dream of. Your pulse quickens, your knees go weak. Oh, yes. Zebra is THAT good." The Zebra sounded great, but, I didn't like it at all. The base caramel just wasn't a style I like, it was buttery, it seemed like decent caramel, but I didn't like the flavor at all. It was well coated though. 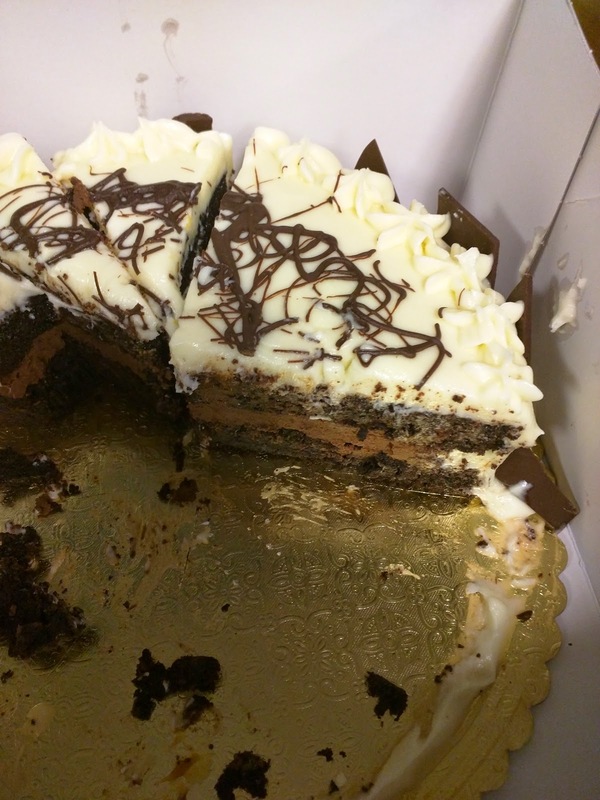 The zebra drizzle couldn't save it, and perhaps the low quality chocolate added to the flavors that I didn't like? If at first you don't succeed, try, try again? 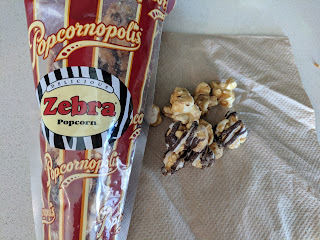 I tried the Zebra again a year later, when a co-worker brought in a big bag full. And this time ... I really liked it? The caramel was thick, buttery, sweet, rich, decadent. The kernels ridiculously well coated in it. I liked the flavor this time. The white chocolate drizzle I also really liked, sweet, creamy. The milk chocolate was minimal, but it was fine. I'm glad I gave this another try, and gladly devoured a big portion (way too big, really, given the nutrition stats!). "Our award-winning recipe remains a closely guarded secret. But we CAN tell you that we use only pure cane sugar and real creamery butter. Even before you take your first bite, the ultra-rich aroma will blow your mind!" The final selection in my cone quartet was pretty standard caramel corn. Rich, dark buttery caramel, well coated. Good enough, but nothing special. "As American as freedom, for more than 200 years, we've enjoyed this sweet and salty Kettle Corn with its unforgettable crunch." I also tried a regular bag of Popcornopolis, when I found it at a local store a few months later. 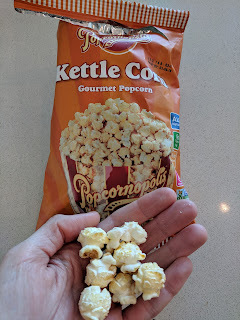 I tried a new, but simple flavor: kettle corn. Well, huh. I found a kettle corn I like, that *isn't* only sold at a single farmer's market, during the summer only, in New Hampshire. 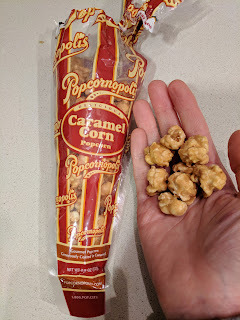 Ok, sure, I didn't like this nearly as much as my favorite best kettle corn ever, but, I liked it, which is significant, as I usually hate all kettle corn that isn't "my" kettle corn. It was sweeter than "my" kettle corn, but it did have the salty aspect to counter it. The pieces were well coated. It tasted fresh. The kernels were all large and popped properly. 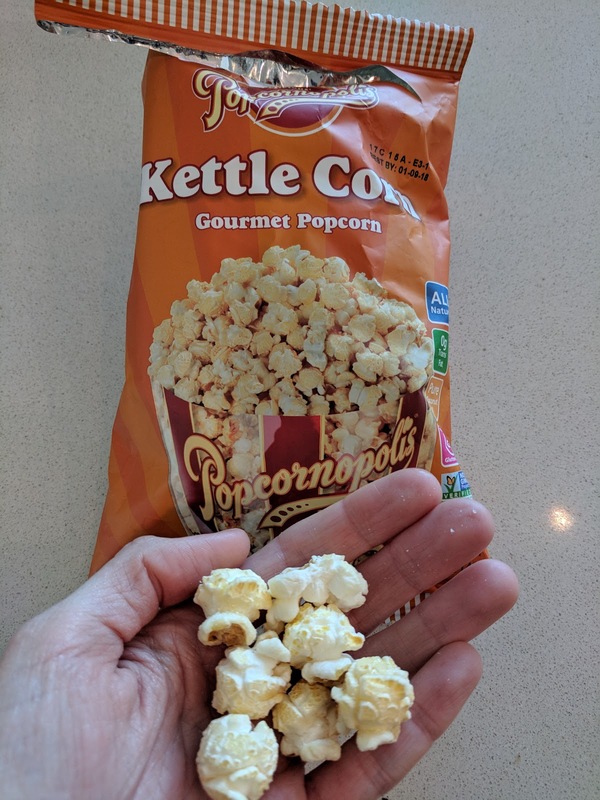 Very solid kettle corn, and one I'll even consider buying when my freezer supply of my farmer's market kettle corn runs out. 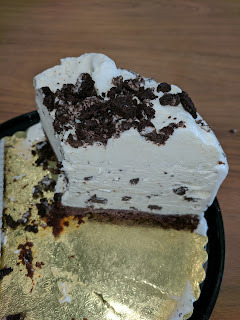 Another year, another few Bi-Rite ice cream reviews, but this time, of the ice cream cake! They keep showing up in my office. 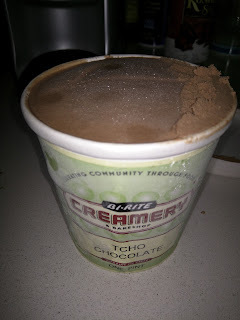 For my thoughts on the general ice cream, see my previous reviews. Another day, another, "quick, we are having a celebration, come get ice cream cake!" message sent out one afternoon. Of course I went running, to find ice cream cake from Bi-Rite. The base was chocolate cake, a fairly thin layer, compared to the others. It was very firm, not really what I think of as cake, almost more like a very dense brownie. Next was the main attraction: the ice cream. This layer made up probably 70% of the cake, and was really just a thick solid mass of cookies and cream ice cream. It was ... fine. Not particularly creamy though, and cookies and cream isn't ever a flavor I go for. The top layer was whipped cream based frosting, and it was decorated with crumbled Oreos. The fluffy whipped cream was sweet and quite tasty, and it melted nicely, although, faster than the ice cream layer. The Oreos were just kinda mushy/soggy. Overall, I felt this ice cream cake lacked ... research? I dunno. I'm not going to claim that Carvel cake is amazing or anything, but, they have a formula that works, with layers in the right proportions. 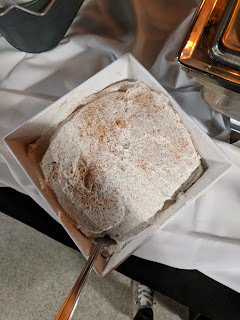 This was really just a whole lot of ice cream, with some hard cake strangely at the bottom, frosting that melted faster than ice cream and slid off, and mushy topping. The components were all fine, but it certainly didn't add up to anything special. Chocolate Midnight Cake with Cream Cheese Frosting. I'll be honest. I'm not a big cake fan. Not that I don't like cake, but, because I generally would pick most other things over a simple cake. But, when someone says there is cake to try, how do I resist? This was quite good, for a cake. Two layers of very dense, super moist, rich, dark chocolate cake. Borderline brownie-like. In-between those layers was a very thick milk chocolate, more like a fudge than a frosting due to its thickness. The frosting was cream cheese, sweet, creamy, and delicious, but it seemed like a slightly strange pairing with chocolate. Dark chocolate shards lines the outside, high quality dark chocolate, with a nice snap. Overall, very good, again, for a cake. It had been a few years since I had Bi-Rite ice cream, and then, recently, I was surrounded by it. I was curious if my opinion had changed, since, well, I never found the ice cream to be anything special. See my original review. 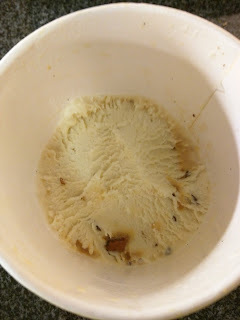 First, a friend brought over several pints of Bi-Rite ice cream to a party at my house. None were flavors I would have picked, but, I was glad to try more flavors. Then, a week later, we hosted a Bi-Rite event at my office, with a bunch more flavors. My opinion remains largely unchanged. It isn't bad ice cream, but, it just isn't any better than other ice cream. I'm not sure why people are so crazy over it. 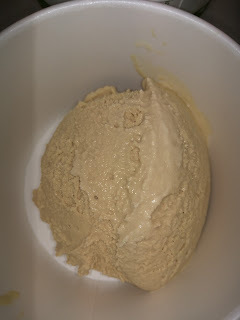 I did notice that Bi-Rite ice cream freezes much softer than many ice creams. That is, if you put pints of Bi-Rite, Three Twins, and Ben & Jerry's all in the same freezer, they come out at totally different softness levels. I've always been struck by how hard Ben & Jerry's freezes, you really need to let it soften a good 10 minutes before even attempting to scoop. Bi-Rite is on the other end of the spectrum, actually scoopable from the moment you pull it out. Three Twins is somewhere in the middle. I wonder what causes this? I don't generally like chocolate ice cream. I like chocolate, I like ice cream, I like hot fudge on ice cream, but, for some reason, I just don't tend to like chocolate ice cream, or even chocolate based ice cream. But this was very good chocolate ice cream. Smooth ice cream, really rich flavor, and it reminded me of a rich chocolate mousse. I'm still wouldn't opt for chocolate ice cream generally, but, if I wouldn't turn this down. "We make our Cookies and Cream with Newman O’s, hand chopped, and mixed in to our ice cream." This was pretty standard cookies & cream ice cream. 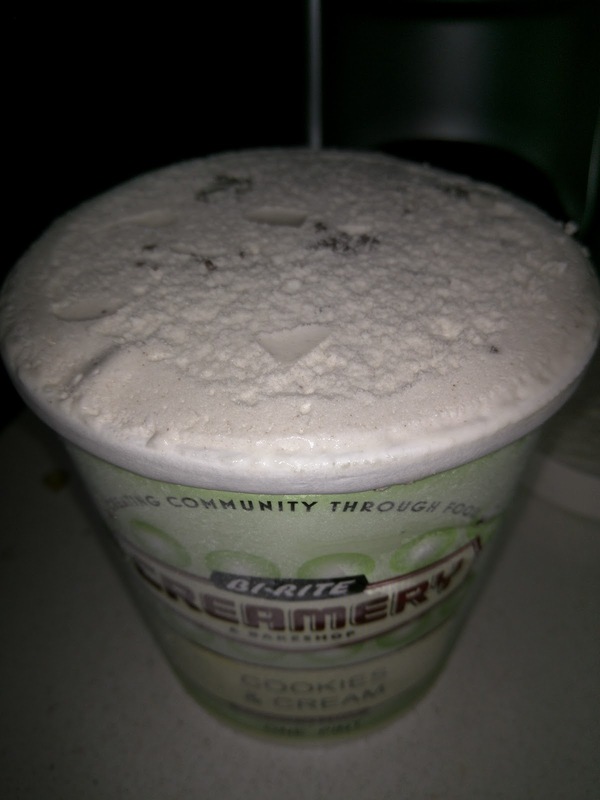 Decent enough vanilla ice cream base, decent distribution of decent sized chunks of cookie. Decent is really the best description I have for it. Nothing wrong with it, but nothing really remarkable either. The week after a friend brought Bi-Rite ice cream to my house, we hosted Bi-Rite at work for an ice cream tasting. We had four flavors (peach, roasted banana, salted caramel, balsamic strawberry), and, of course, I tried them all. I failed to get a photo of the roasted banana. It tasted ... like banana. Ojan said, "it tastes just like a frozen banana". For me it was just too plain, as I'm used to Chunky Monkey, or at least lots of toppings on a banana ice cream. We all ranked it third. The first flavor I tried was peach, as I've had salted caramel and strawberry balsamic before, and banana sounded boring. I didn't care for it. It tasted ... too healthy. Yes, this ice cream was too healthy for me. It really did taste like frozen fresh peaches, so, if you like peaches, then perhaps it is for you? 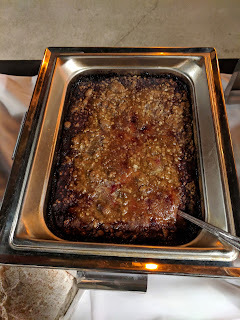 My least favorite, and no one else wanted more than one bite of this either. "Our number one seller, famous for the deep rich flavor of sweet caramel balanced with just the right amount of salt." Salted Caramel is probably Bi-Rite's most famous flavor. It was just way too sweet for me. Ojan and I both pulled back a bit after taking a bite, equally shocked by how sweet it was. He wanted some rich chocolate sauce on top to cut it. And some whipped cream. It was really just a lot on its own. It did melt nicely though. Second choice. "We only make this flavor when local strawberries are in full season and offer the best flavor. Balsamic vinegar enhances the strawberries’ fantastic flavor even more." 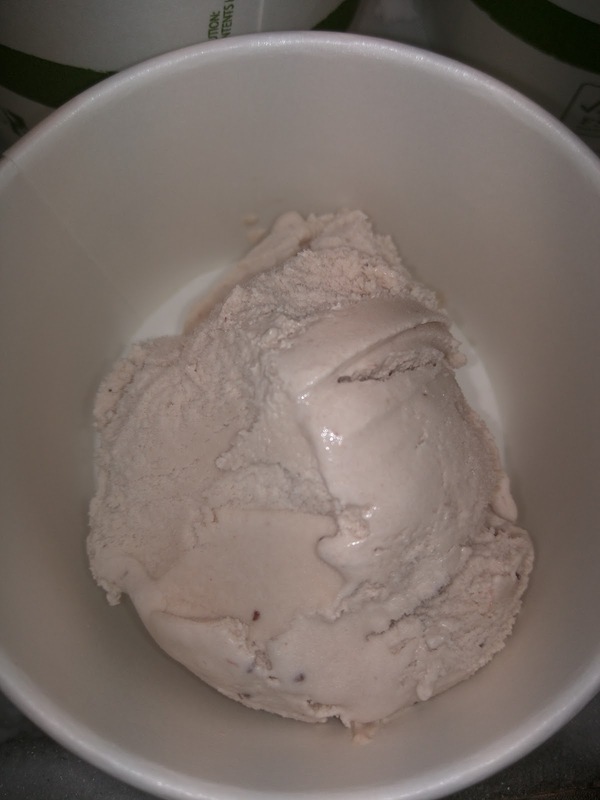 And finally, another Bi-Rite Signature flavor, balsamic strawberry. This turned out to be everyone's favorite, as the flavor was the most complex. Fruity, like the peach, but, the balsamic added some interest to it. I think in general these flavors were just a bit too plain for me. I think they'd make great foundations for a sundae, but aren't the flavors I just want a scoop of. Bi-Rite. Ah, Bi-Rite. Everyone loves this place. The lines are epic, even on the coldest San Francisco "summer" days. Somehow, the magic has been lost on me. Just like Humphrey Slocombe, they use Strauss Organic Dairy. They use organic, local ingredients. Yadda yadda yadda. The ice cream still just doesn't seem that much better than generic grocery store ice cream to me. Malted Vanilla with Peanut Brittle and Milk Chocolate Pieces. "This flavor combines malted vanilla ice cream with house make peanut brittle (made with Virginia peanuts) and TCHO milk chocolate pieces." This pint reminded me of a pint of Ben & Jerry's - I had a hard time not eating the whole thing in a single sitting. But, not because it was awesome. Because every bite seemed like it was about to be awesome. The ice cream base was fairly boring, perhaps slightly malty, but just vanilla ice cream. It wasn't particularly creamy. The milk chocolate pieces were tiny flecks, and there weren't many of them. Nothing so far was very tempting. But ... the peanut brittle. That was my weakness. But again, not because it was awesome. Because it was almost awesome. There wasn't much of it. It wasn't really brittle, but more like little bits of peanut surrounded by some caramel. But I couldn't stop digging for more. This is exactly what happens to me with a pint of Ben & Jerry's, particularly with Heath Bar Crunch. The ice cream isn't great, but I can't help myself from seeking out "just one more chunk" of the candy. So, did I easily finish the pint? Well, yes. But, I can't say it was a very rewarding pint. Almond Fudge Swirl: Meh. Mostly just vanilla ice cream, didn’t get much of the other flavors. Brown Sugar with Ginger Caramel Swirl: Way too sweet. Just sweet. Ricanelas (cinnamon with snickerdoodles): Ok flavor, but nothing special. Salted Caramel: Nice and creamy, good caramel and salt flavors. There is a reason this flavor is famous. Pumpkin: Not very pumpkin-y, not very well spiced, meh. Vanilla : Very generic, nothing special. Today's adventures in Waffling Leftovers* isn't quite a success story. Hey, sometimes it happens. I haven't kept stats exactly, but I think that about 60% of the time, my waffling experiments are fine, (good, but not life changing), 20% of the time they manage to transform my leftovers in magical ways (I'm looking at you pizza, donuts, and more! ), and then, like this, 20% of the time they pretty much fail. But hey, I still have fun with it. 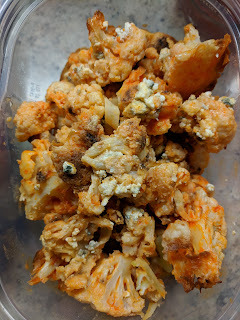 Today's story also involves two totally different adventures in buffalo cauliflower leftovers - one batch prepared at a fancy restaurant, one prepared at home. And one success, and one ... not so success. The first attempt was the least successful. 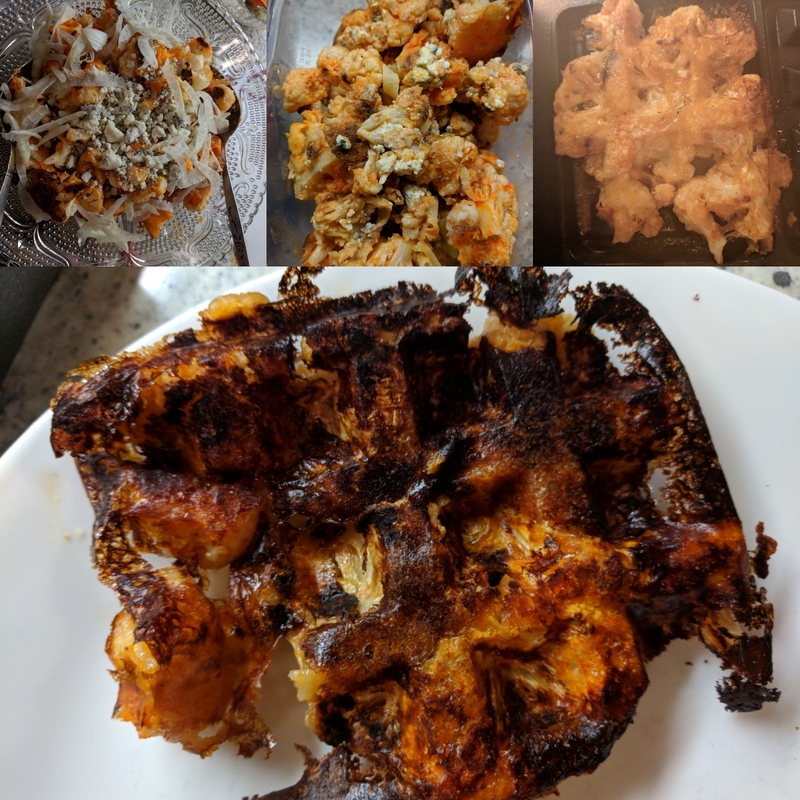 Buffalo Cauliflower: Will it Waffle? The answer is clear. Uh, no. 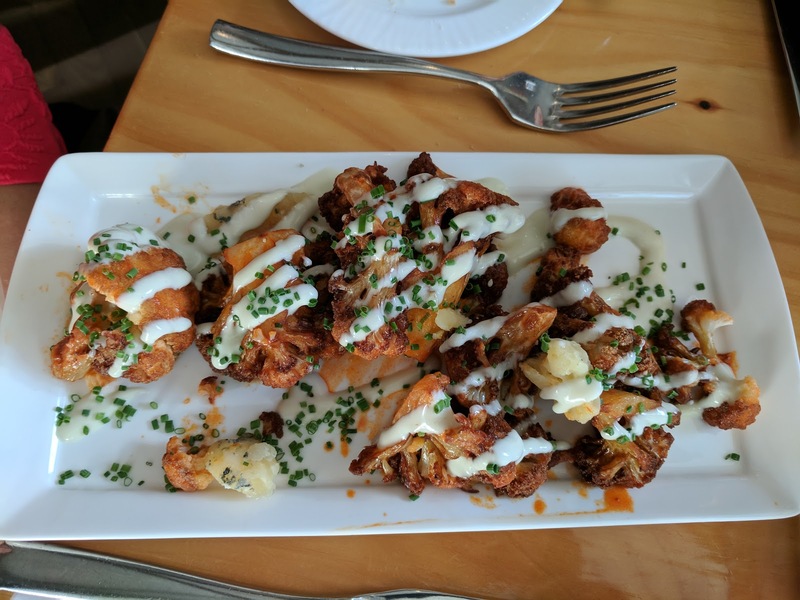 The Original: Buffalo Cauliflower with Bayley Hazen Blue Cheese. 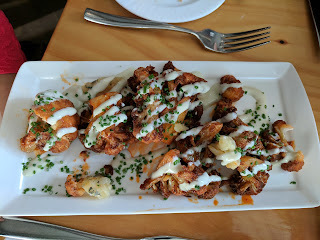 The original dish was "buffalo cauliflower", from Pine restaurant in Hanover, NH. 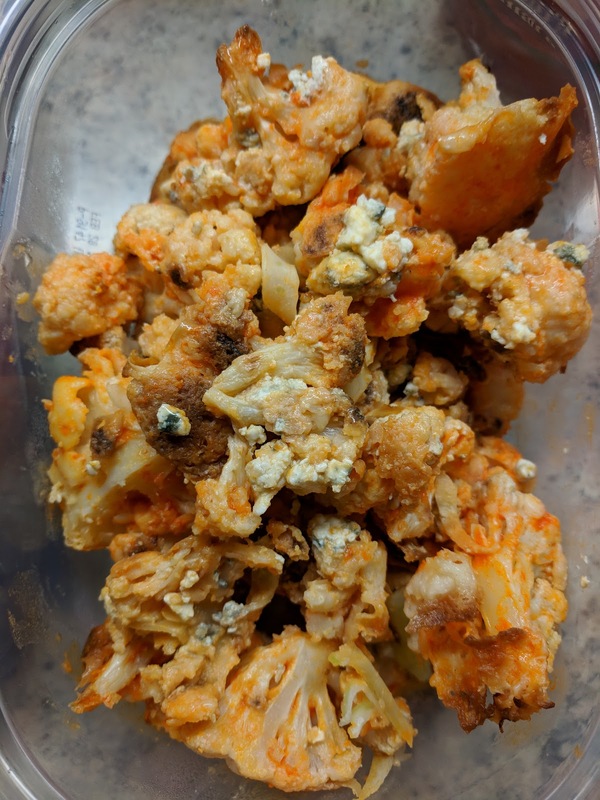 Buffalo cauliflower is sorta what it sounds like - imagine treating cauliflower like chicken wings, smothering it in hot sauce, and serving with blue cheese (in this case, chunks of blue cheese and a drizzle on top). I had some of the leftovers cold first. 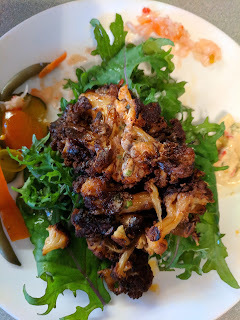 The cauliflower was soft and even hotter (spicier) than originally, as the hot sauce had permeated the cauliflower even further. It was perfectly fine cold, and I considered not waffling it, and just tossing it with some greens to make a buffalo cauliflower salad. But, my plan was to waffle it, so waffle if it I did. 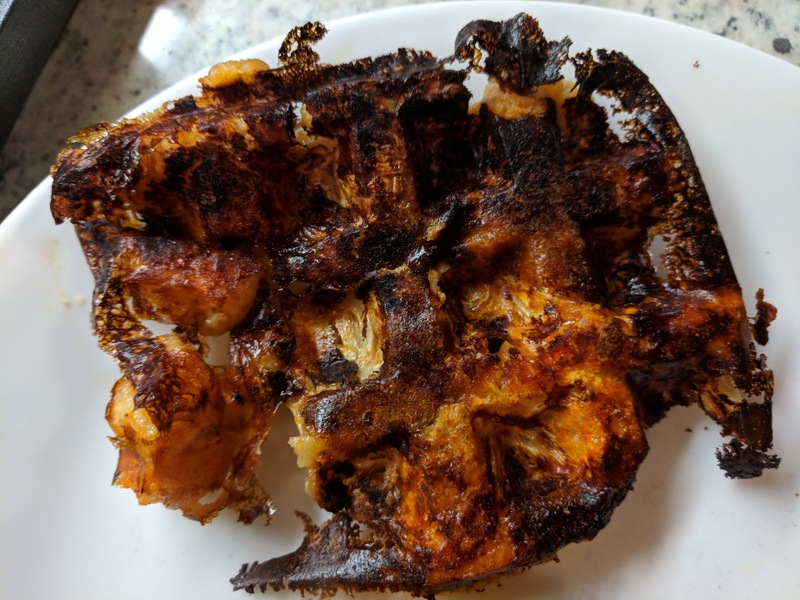 Still, I thought it would get crispy, and that is what I was going for. It never did. I let it go longer and longer, and even cranked the heat up, hoping for crispy bits, but, it never happened. Once it reached the "I'm about to turn into a horribly burnt mess" phase, I gave up, and tried to remove it. But of course it didn't remove easily, as nothing was stuck together. Doh. Kale Salad Topped with "Waffled" Buffalo Cauliflower. I decided to serve it over baby kale, going back to my original idea of enjoying the leftovers as a salad, even though the cauliflower was now warm. 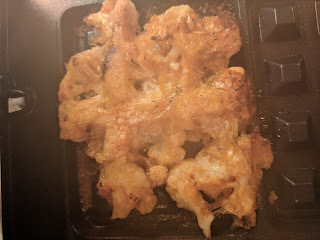 It was ... fine I guess, but really just heated up cauliflower, and reheating it in any other way would have been equally effective. The waffle iron didn't add anything to it, and, I think it actually was better cold. Clearly, not an experiment to repeat. 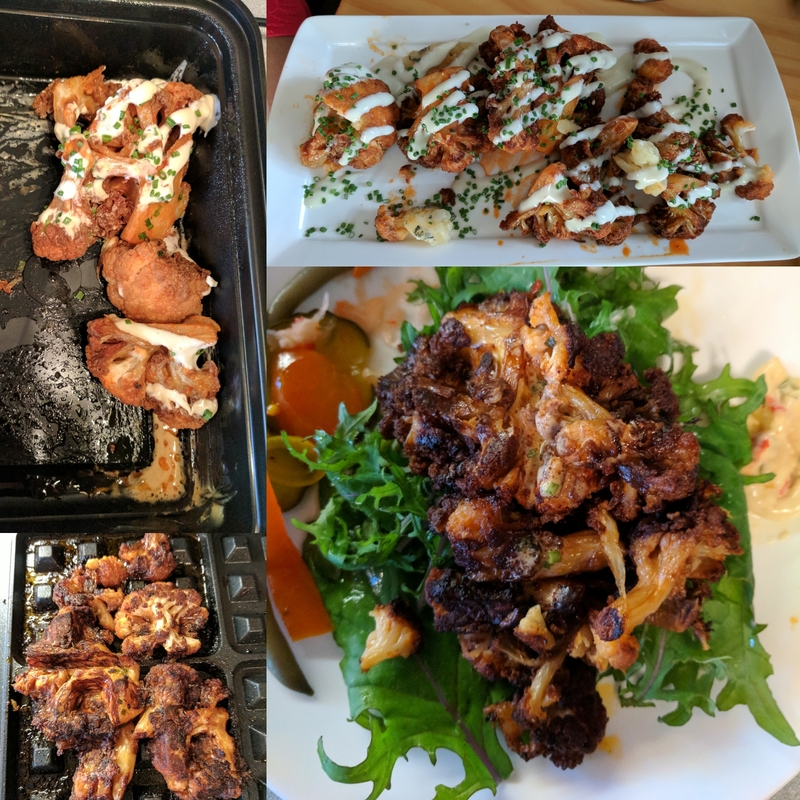 Except, well, I did repeat it, just with a very different batch of buffalo cauliflower. Homemade even. I'm not entirely sure why, but batch #2, using a totally different base, worked much, much better. So now, when you ask, "Leftover Buffalo Cauliflower: Will it Waffle? ", my answer is ... YES! 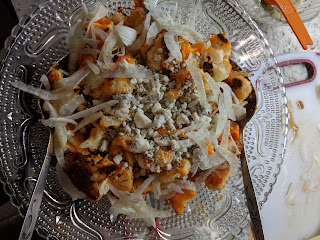 The Original: Buffalo Cauliflower with Blue Cheese and Shaved Fennel. The original dish this time was made by my mother as a appetizer for our Christmas eve party. The cauliflower was battered and baked, then tossed with Frank's hot sauce and baked again, then topped with blue cheese crumbles and shaved fennel. 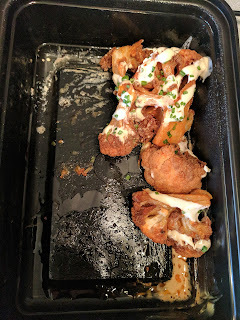 I really liked the battered cauliflower, but next time I'd drizzle blue cheese dressing rather than just blue cheese crumbles on top, to provide more creaminess and counterbalance to the spice. The shaved fennel was perfect, a more sophisticated version of celery, basically. A tasty dish in its original form. The leftovers were fine cold, although the batter was now mushy, and that wasn't quite appealing. Spicy flavor was still there, nicely complimented by the blue cheese. It was my mother who suggested waffling this, and I actually had forgotten my previous attempt, so I didn't raise any red flags. We put it into the iron, no modifications, at 350 degrees. 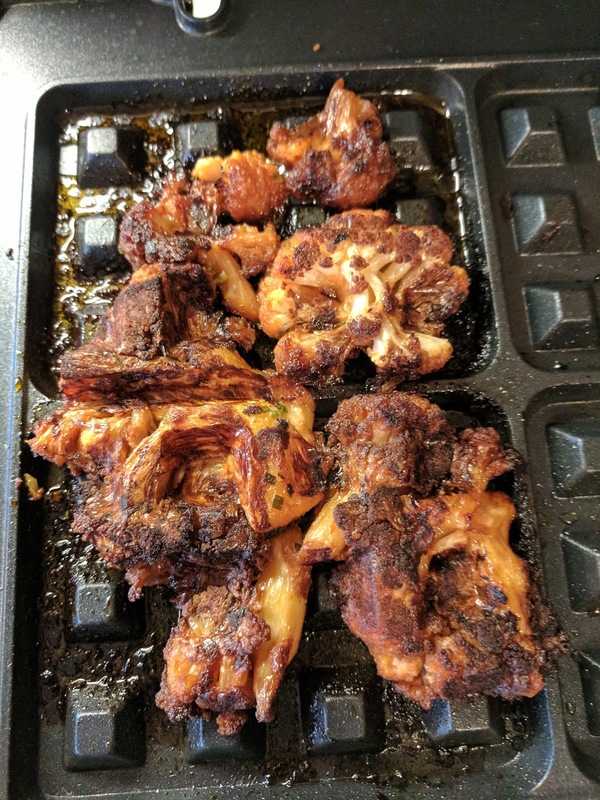 About 7 minutes later, I raised the lid to find a perfect cauliflower waffle, albeit a bit burnt ... I got distracted and wasn't checking on it carefully enough. It extracted perfectly. This one worked great. I think the batter on the cauliflower was the key, as it helped bind it together in a way the other version did not. This, drizzled with some blue cheese dressing, and topped with shaved fennel, was perfect. Spicy, crispy, creamy ... better than the original, and a fully composed dish, which, I totally failed to take a photo of. 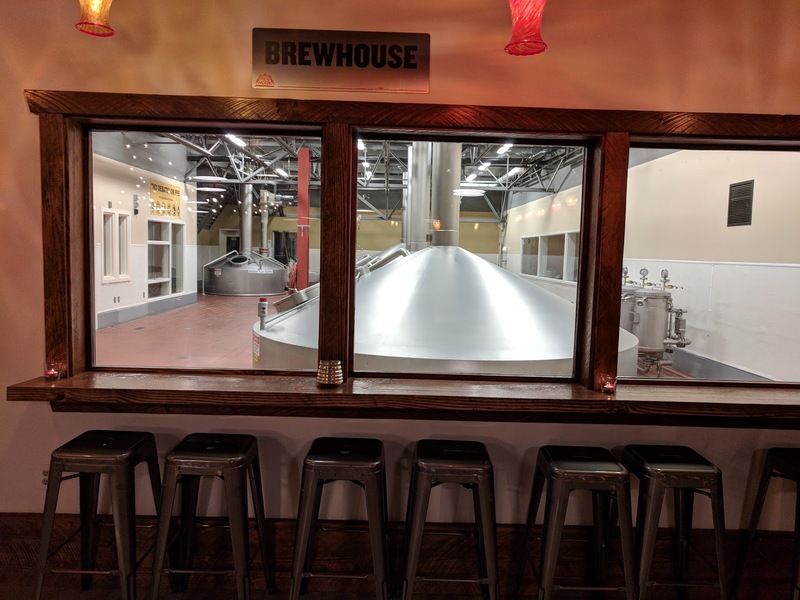 Redhook is a brewery in the Seattle area that also randomly has a facility in New Hampshire, my home state. But that doesn't mean I had heard of it before, as I'm not a beer drinker. 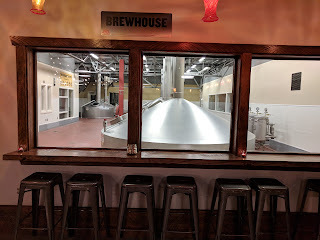 Which I'm sure raises questions about why I'm writing about a brewery. 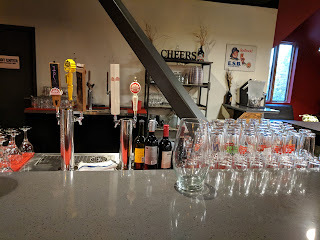 I'm not writing about a brewery, exactly. I'm writing about the experience of hosting a private event at their facility. It had shockingly good food. 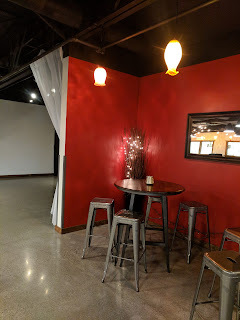 The private space we had was upstairs, above the regular restaurant/pub, at the Woodinville location. 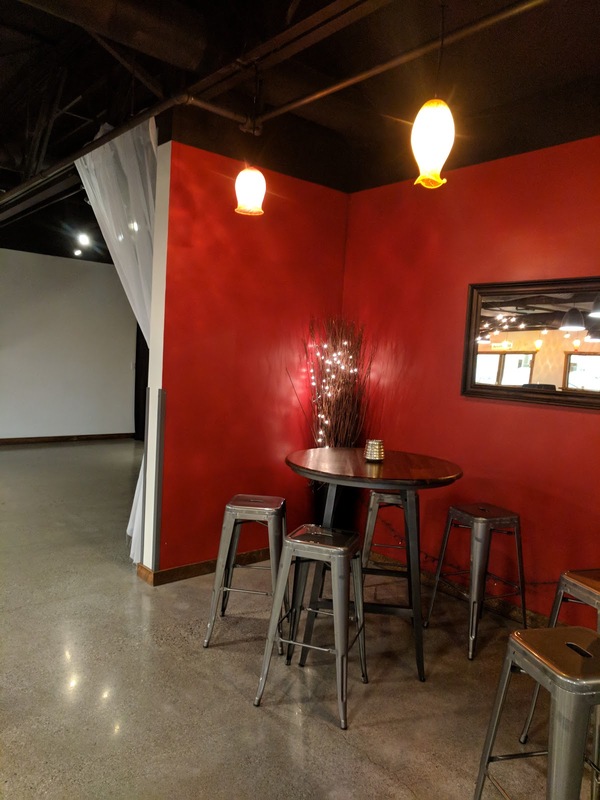 The space was huge, with plenty of banquet tables for dining. Along the edges of the room were also high tables, with high stools, for more intimate convo. You could also see into the production facility through a viewing area. 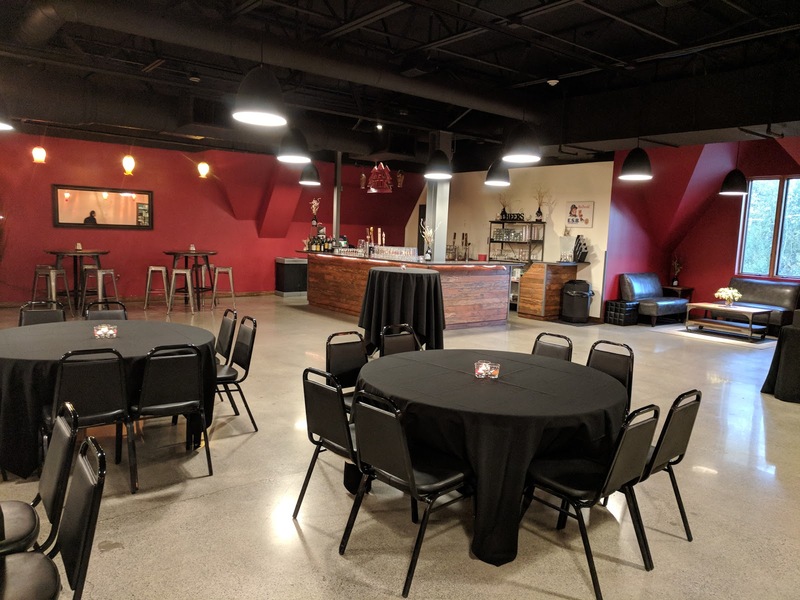 The event team was very easy to work with, and they had many different easily configurable packages to choose from. We ordered an appetizer buffet and a main dinner buffet. While it is a brewery, they did also have a nice wine line up. 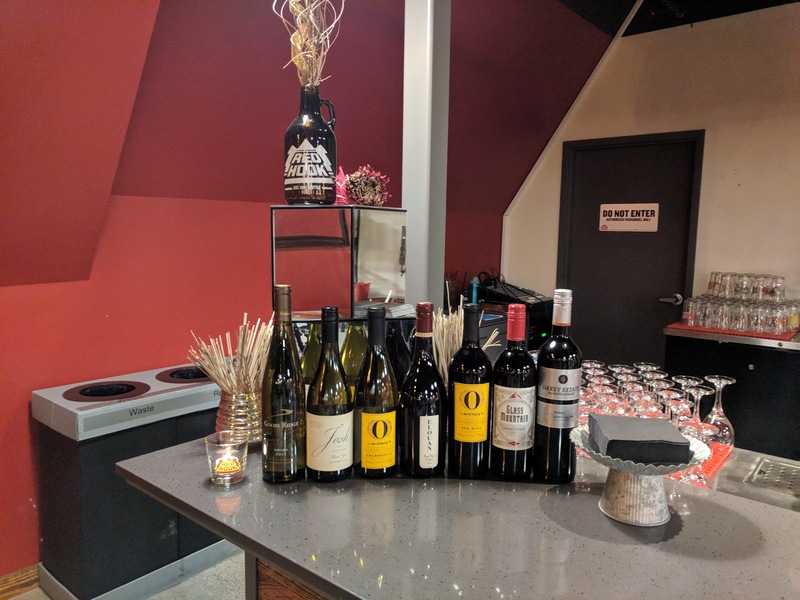 We were all pleasantly surprised by how good some of the wine was. Of course the focus is the beer, on tab, along with cider. We had a private bar in the space, with a bartender all night. We started with an appetizer buffet. These were the items I was most excited for, but ended up not really liking. I was worried after trying the appetizers that we were in for some horrible food. Luckily, I just needed to wait and get past them. 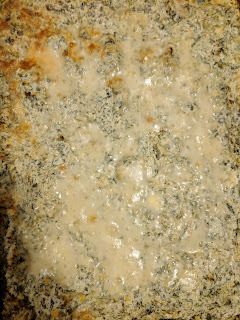 House-Made Spinach Artichoke Dip with sliced French baguettes. This I didn't care for. It was mushy, not very flavorful. Served with basic baguette slices on the side. Redhook Wings with celery sticks + bleu cheese dip. 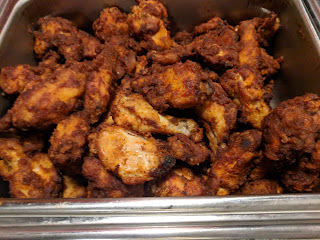 "Chicken wings tossed in Longhammer IPA BBQ Sauce." 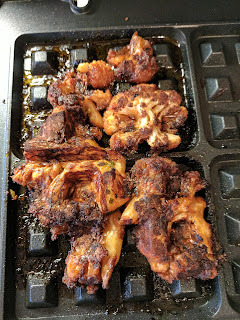 I don't like chicken so I skipped the wings, although I did try some of the bits that fell off and were left behind in the serving pan so I could taste the flavor of the coating. It was ... fine. Not exciting. The menu said we would have celery sticks and blue cheese dip, but alas, we had no celery sticks. Those are the part of wings that I actually like! (Ok, yeah, maybe I just like the dip). "French brie, puff pastry, apricot jam, dried fruits, nuts, crackers + fresh bread." This is the app I ordered mostly because I really wanted it. 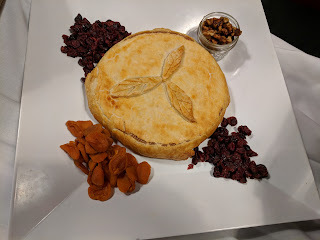 I love warm gooey baked brie and I adore pastry. Sadly it was not served warm, so no ooey gooey cheese as I hoped. The pastry not particularly flalky nor buttery. It was supposed to have apricot jam in it as well, but it did not. That component would have provided some flavor and sweetness to pair nicely with the cheese. The candied nuts were kinda bitter. 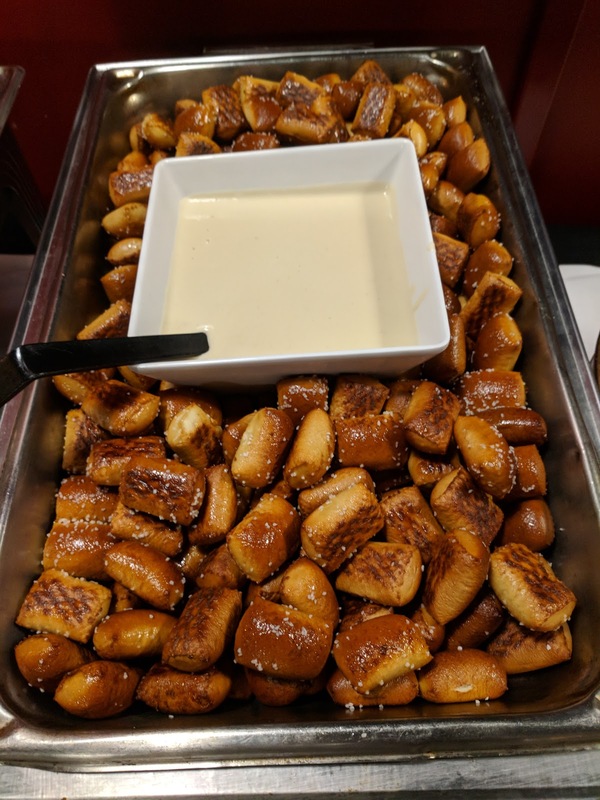 Brewery Pretzel Bites with white cheddar ESB sauce + whole grain mustard. The pretzel nuggets were pretty standard, nothing special. 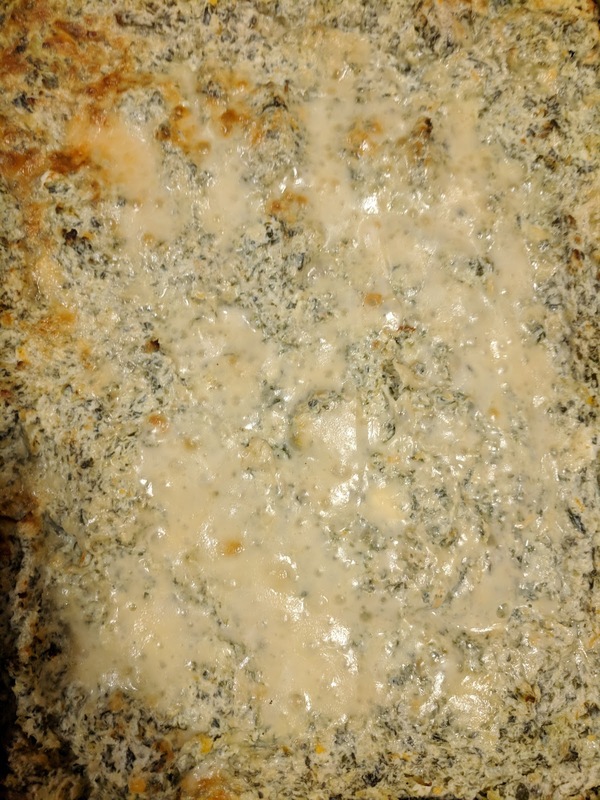 But the cheese sauce was great! Warm, smooth, cheesy, quite flavorful. I really liked it. There was also a grainy mustard on the side. This was the best of the appetizers, just for the cheese sauce, but paled in comparison to what was to come next. As I mentioned, I expected to like the apps and not really the main dinner, but the opposite is what happened. The menu we had was the "Mount St. Helen's", priced at $22 per person. Our package seemed pretty simple: salad, chips & dip, sausages and hotdogs. Not exactly exciting. Other menus were things like the "Mount Rainier" made of sandwiches, "Belltown" a burger bar, "Market Street" a taco bar, "Greenwood Ave" a gyro bar, "Pike Street" the pasta bar, "Phinney Ridge" the Mexican "fiesta", "Golden Gardens" the bbq buffet, and then some fancier, higher priced buffets with things lie pork chops, prime rib, steaks, rack of lamb and salmon, but these were double the price. 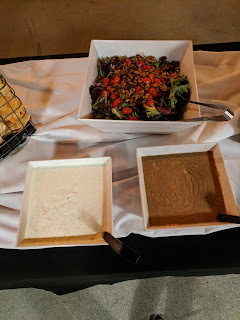 I had the ability to choose one salad for the group (from a choice of mixed greens, ceasar, or argula & ham), the choice of 2 mains (2 styles of brat, hot dog, or reuben), and the rest was fixed: fruit platter, chips & dip, and cookies. More on that later point soon. I also opted to have our french fries from the appetizer package served with the main dinner, as that seemed more fitting than as appetizers. "Mixed field greens salad with candied walnuts, grape tomato, pickled red onion, house ranch + IPA parmesan vinaigrette." We started with salad, which people seemed to appreciate. The first thing to run out all night! I tried it, it was ... just salad. The candied walnuts here were also bitter. Greens were fresh enough. I tried the ranch, it was ... just ranch. House Parmesan Chips + Chipotle Ranch. Housemade chips, all assorted sizes and shapes, some really huge. Some were crispy, some were soft, both were enjoyable in their own way. They were coated generously in parmesan too. But the dip? WOW. I love, love, loved this. Spicy, creamy, just downright incredible. The night was looking up. I also brought some of these back to the hotel with me (the event staff were encouraging us to take leftovers, gave us boxes and everything). I really, really enjoyed them the next night. Second best dish of the night. Seasoned French Fries with ketchup + house ranch dip. 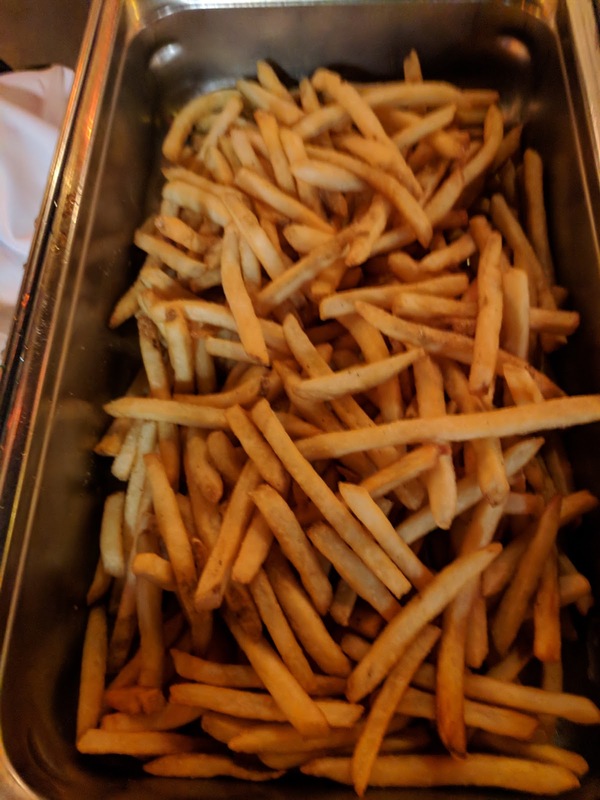 The chips were very good, but nothing prepared me for how amazing these fries were. Yes, the fries. 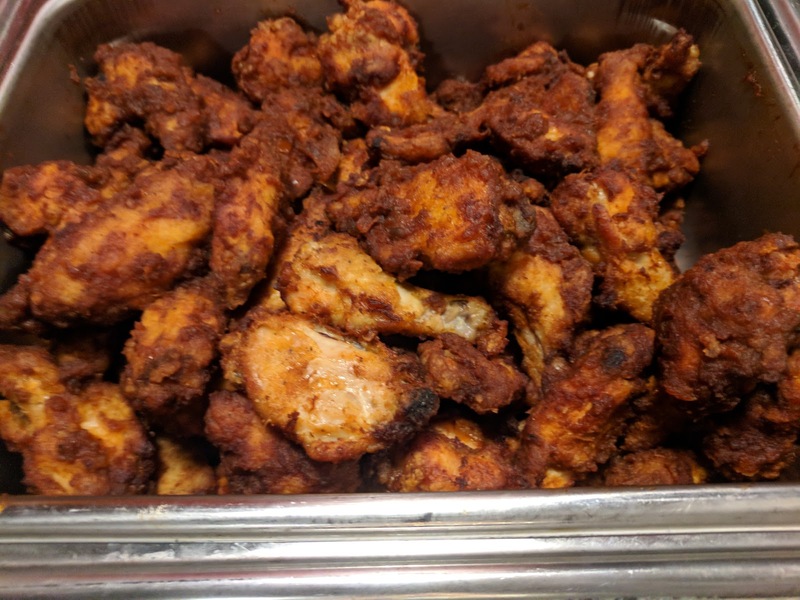 From a buffet. Some of the best fries I've had in years. Much like the chips, they came in many assorted sizes, some crazy long. They were perfectly crispy outside. Fluffy inside. Really well seasoned. And just really tasty. I only took a few on my plate to start, just to try them, and was shocked. I immediately went back for more. And more. And more after dessert. And more on my way out the door at the end of the night. They were just too good to resist. I can't explain it. They were in a buffet. I know this. But they stayed hot and ridiculously fresh somehow. I had some even an hour later, and they were *still* good. The menu said they would come with house made ranch dip, but they did not. 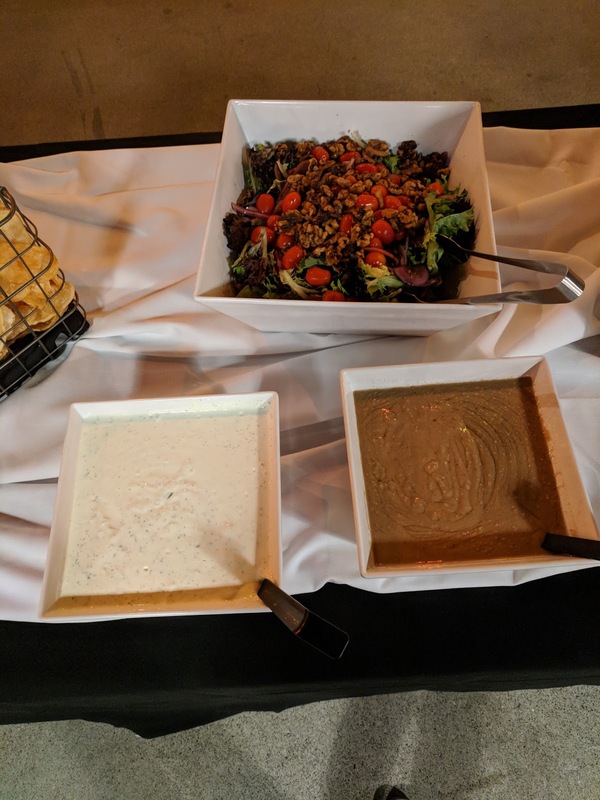 We did have ranch with the salad though, so people could have used that I suppose if they wanted. Of course, I was dunking them generously in the chipotle ranch, because it was just so good, but even without, they were just fries perfection. Dish of the night, no question. For the entrees, we had two different types of composed sausage, except they came broken down into components so guests could assemble their own. The hot dog was for the "Volcanic Chili Dog", which was listed as "Nathan's beef hot dog, chili, cheese blend, on pioneer roll." I did not have the hot dog, as I don't love beef hot dogs, and opted for the other option. They did look like they were actually all grilled though. I'm not sure what "pioneer rolls" are, but there were regular buns on the side. 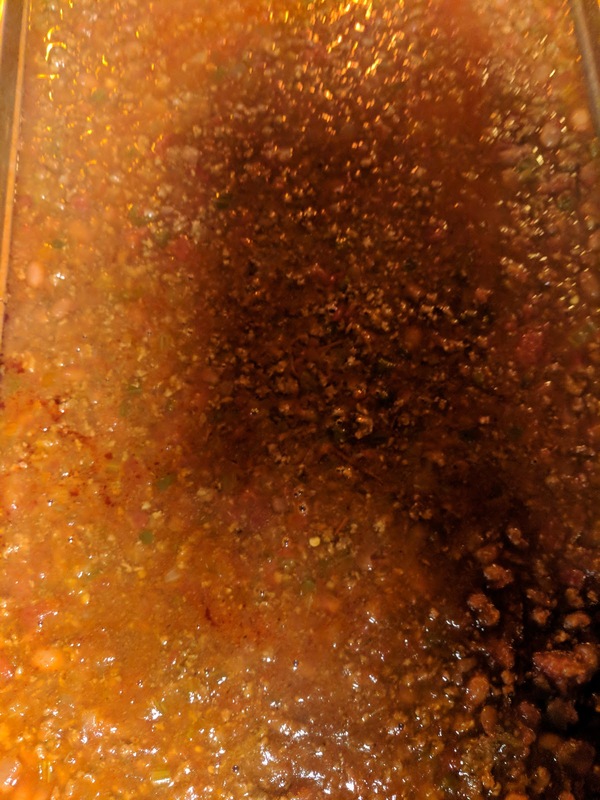 The chili was also on the side, beef and bean chili. I didn't try it either. The menu said there would be a cheese blend, but alas, there was not. Most people never figured out that the chili was to put on the hot dogs (or on the fries too even? ), so this went largely untouched. 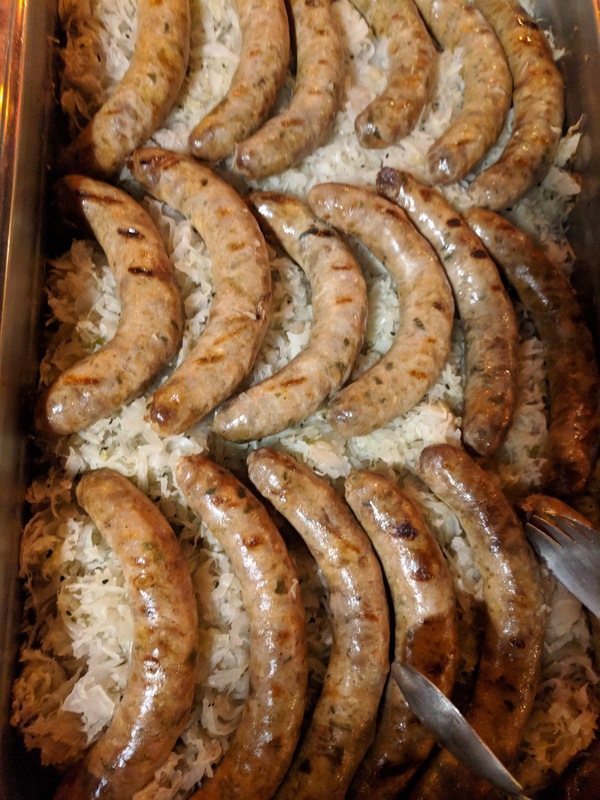 Uli's Jalapeno Cheddar Brat with Caraway Sauerkraut. "All natural pork infused with bold spices, cheddar, and jalapenos. This one's on the spicier end of the sausage spectrum." Next was brats, for a dish listed as "Jalapeno Cheddar Brat with caraway sauerkraut, whole grain mustard, pretzel bun." 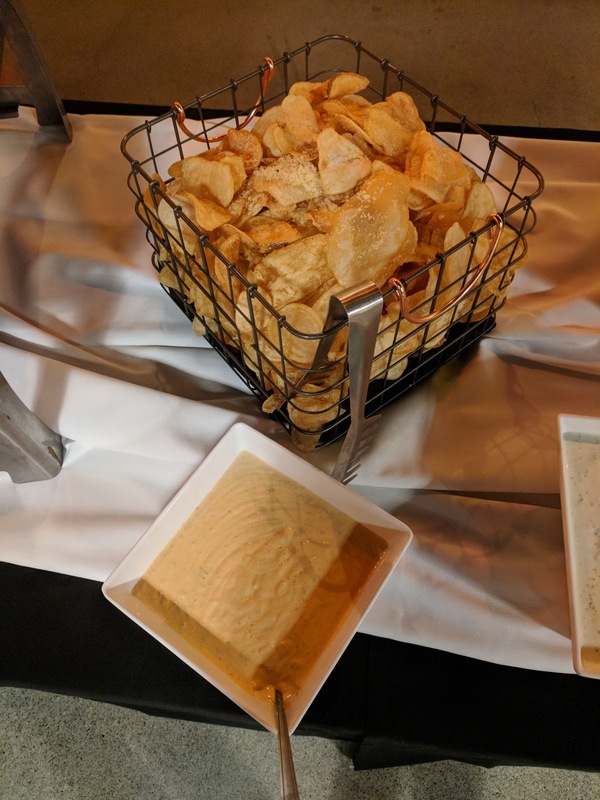 There was no whole grain mustard, although there was beer mustard over with the pretzel bites on the appetizer table that some people went back to get. 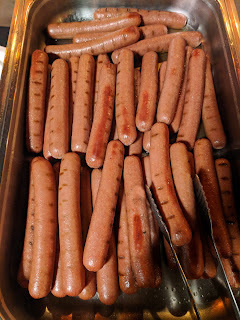 There was no pretzel buns, only the plain ones that seemed to go with the hot dogs. Which is too bad, because pretzel buns sounded great. I didn't try the kraut, under the brats, since I don't care for kraut. But I did try a brat, and ... I really liked it. 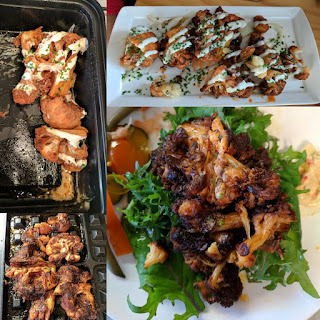 I was pretty surprised, and to be honest, didn't plan to have one at all, and only took one because I didn't think I'd like the fries/chips very much, hadn't eaten much from the lackluster appetizers, and was worried I should be responsible at eat something "real" before moving onto dessert. 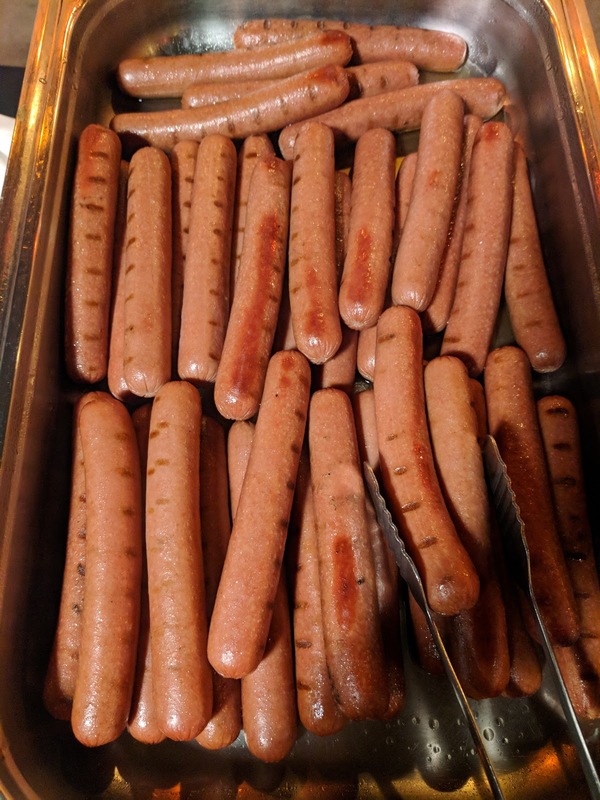 Like the hot dogs, they were actually all individual grilled, grill marks and all. Nice snap to the casings. Super flavorful filling, a bit spicy, really well seasoned. The meat was pork although that wasn't obvious, the flavor fairly masked by everything else going on. It was kinda chunky and a strange texture, but, I liked it. Overall, good, far better than expected. We had a package that had only cookies (and fruit) as an option, and I worked hard to make sure we had "real" dessert. Red Hook did have an a la carte dessert menu for events, all bite sized things: cookies, brownies, (including bacon bourbon ones! 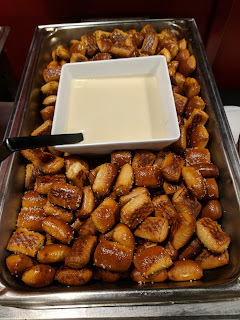 ), cheesecake squares, bread pudding bites, and the like. These came priced at $4 each, but weren't that much more exciting to me than the cookies. These still don't qualify as "real" desserts to me. I was able to add on real desserts. The desserts were fabulous. This was part of the dinner package. 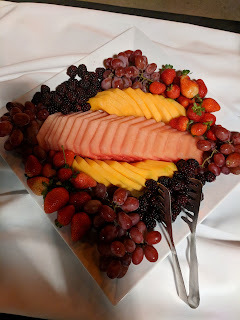 Due to my severe allergy, we explicitly said not to include melon in the fruit platter. And ... melon. I obviously stayed far away. Not that the fruit looked very tempting anyway. I did mention it to the event planner, who immediately remembered and felt awful. She brought out other fruit platters without it, and removed this from our bill. 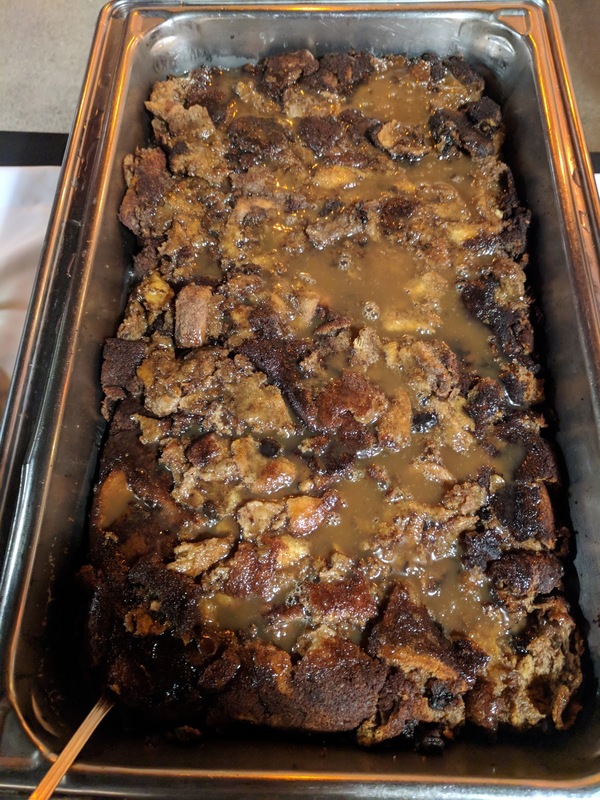 Spiced Bread Pudding with Bourbon Caramel Sauce. First up was the bread pudding. I was very excited for this one ... bread pudding with bourbon caramel? And whipped cream on the side. Served warm. Yes! It was ... only ok. The bread was pretty dense, although it was the cube style I like. Not the best base, and a bit burnt on top as you can see. But the sweet sticky bourbon caramel was excellent. I got as much of that as I could, and it helped quite a bit. I give them major points for serving this warm, and keeping it warm throughout service, but my least favorite dessert, and I wasn't compelled to go back for more of this one. "Strawberries, blackberries, and blueberries topped with an oatmeal crumble." The berry cobbler was decent, again, served warm, which I really appreciated. The fruit was soft and stewed, fairly sweet, but also a bit tart. It too was spiced in a way I didn't love, but not nearly as strongly. The crumble top was decent, a mix of oats and whatnot. Overall, a standard crisp, well executed. I had some the next day (they offered us togo boxes at the end to take stuff home with us! ), and it was actually even better cold. I might have had it for breakfast. And I might have loved it. I adore them for including this. A huge bowl of cinnamon whipped cream, to put on either dessert. Lots of cinnamon flavor, excellent. 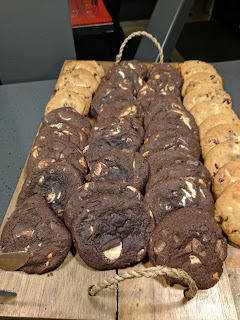 Cookies: Triple chocolate chunk, white chocolate cranberry. And finally, the cookies, included in the dinner package. There were supposed to be two other kinds (chocolate chip, gingerbread), but we had only two kinds. Which was plenty, with all the food. They provided 40 (?) cookies for our group of 80, and I think that fewer than 10 were consumed. Which meant, some people left with cookies, and I, the girl who doesn't really like cookies, eventually tried one. I'm glad I did. Because they were really good. Perfect texture, super soft. Buttery. Sweet. I went for the non-chocolate one, not realizing it was cranberry, and I even loved the cranberry. What?! I always complain about hard little dried cranberries. These weren't hard, they were soft and tart and flavorful and the flavor went great with the white chocolate. 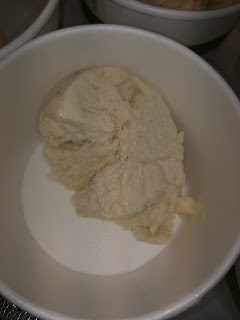 The white chocolate chunks were huge and sweet and creamy. I took one home even for the next day, and loved it then too. My favorite of the desserts, yes, even compared to the warm fruit crisp and the warm bread pudding. Pretty sure that is a first.